Theater Review: Swift Creek Mill’s "Death Trap" Offers Some Good Scares and a Few Laughs | Theater | Style Weekly - Richmond, VA local news, arts, and events. 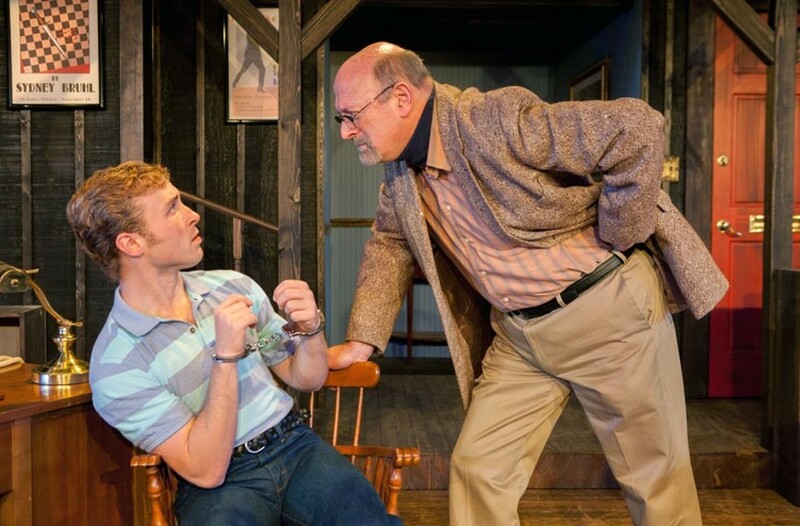 Robyn O'Neill Photography Caleb Wade as Clifford Anderson and Richard Travis as Sydney Bruhl deliver compelling performances in the latest production at Swift Creek Mill Theatre. The first thing you’ll notice at Swift Creek Mill’s “Death Trap” is a set laden with all manner of weaponry. The walls are practically covered in rifles, axes, daggers, pistols and theatrical window cards. The juxtaposition begs audiences to consider Chekhov’s gun, and true to that principle, more than one will go off before the final scene. The plot revolves around playwright Sydney Bruhl (Richard Travis), no longer the Broadway smash he once was, on the day he receives a script for a play in the mail from a former student. That play, “Death Trap,” is good. It’s so good that Sydney finds himself gripped with a murderous jealousy, or so he jokes to his anxious wife Myra (Brooke Ewell). He teases her about the ease with which he might off a young writer, steal his play and plagiarize his way back into the spotlight. The trouble is, nobody — not Myra, not the audience — can tell how serious he is. Travis’ portrayal of the aging playwright keeps us on our toes. You’re never quite sure if he can be believed. It’s a difficult line to toe, and a necessary one for the success of the play. Caleb Wade, portraying the young playwright, Clifford Anderson, is compelling at every turn, and Jennifer Frank garners laughs as psychic neighbor Helga Ten Dorp. Tom Width’s direction is most effective during the big action scenes. This production pulls off quite a few genuine jump scares. But on opening night, the long expanses of dialogue leading up to the action don’t build in a way that feels suspenseful. Scenes drag, and instead of providing that satisfaction of the suspense the script wants us to feel, the eventual climax of each scene suffers from the sense that I’ve had to wait too long for it. Joe Doran’s lighting design and the sound design are excellent. The lightning, the thunder and the rain, the sunlight and moonlight outside the French doors, all feel completely real. Width’s set design is fantastic, almost naturalistic in its attention to detail. Every single item on the set is directly dictated by the script. There’s the office in a converted stable that absolutely looks like one, the colonial elements in the hallway, where the stable leads into the main house, the French doors up stage right. Every element exists to reflect something mentioned in the dialogue, neatly adhering to Chekhov’s statement urging that everything you see must have a role to play in the drama. Swift Creek Mill Theatre’s “Death Trap” runs Jan. 19-Feb. 25. Tickets are $38 for theater only and $55 for buffet and theater. swiftcreekmill.com.